It is an exciting time for the industry: shipments of 100GbE modules exceeded 7 million units in 2018, deployments of new 2x200GbE products have already started, and the first volume shipments of 4x100GbE DR4 (400G-DR4) transceivers are about to start. Yet, it does not feel like a party for suppliers. Vendors are scrambling to maintain decent profitability after pricing continued to decline in 2018. Some of the 100GbE demand disappeared in the second half of 2018 as buyers had problems with inventory buildup. The development of new products requires a lot of investment, but customers are unlikely to purchase these modules until the pricing is “right”. All options are on the table for the next round of upgrades: continue with 100GbE, switch to 200GbE, 2x200GbE and 4x100GbE with breakouts. Google started deployments in 2x200GbE transceivers in 2018 and we expect that demand for these products will peak in 2022, as Googles starts to transition to 2x400GbE modules. The forecast for 400GbE includes 4x100GbE DR4 modules selected by Amazon. These DR4 modules will be deployed in a breakout configuration with DR1 modules on the opposite side of the link. Effectively, each fiber will be carrying 100GbE traffic, aggregated into a DR4 module on one side. Deployments of true 400GbE transceivers will be limited in 2019-2021 to upper levels of switching in mega-datacenters and core routers. 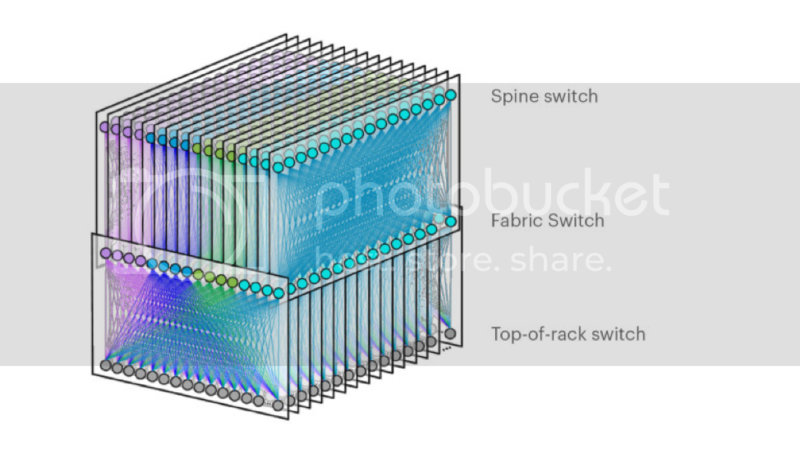 Implementation of high-radix configurations in leaf and spine networks using 400GbE connectivity will be challenging until switching ASICs reach 51 Tbps capacity, probably by 2022-2023. Facebook publicly stated their intent to stay with 100GbE optics for now and use 200GbE or 400GbE transceivers in the next upgrade cycle in 2021-2022. Facebook’s new F16 datacenter network architecture, shown in Figure 1, will require 3-4 times more optical connections compared to their previous design (F4). The first implementation of F16 topology will rely on 100GbE CWDM4 transceivers, boosting demand for these modules in 2020-2022. Facebook is already the largest consumer of 100GbE CWDM4 modules. They use a sub-spec version of CWDM4 transceivers with 500 meter reach instead of 2 km, also known as CWDM4-OCP (for Open Compute Project). The latest forecast database includes sub-spec CWDM4 modules as a separate category. Segmenting the sub-spec products also helped us to refine the market data collected for 2018, resulting in higher than previously reported sales. 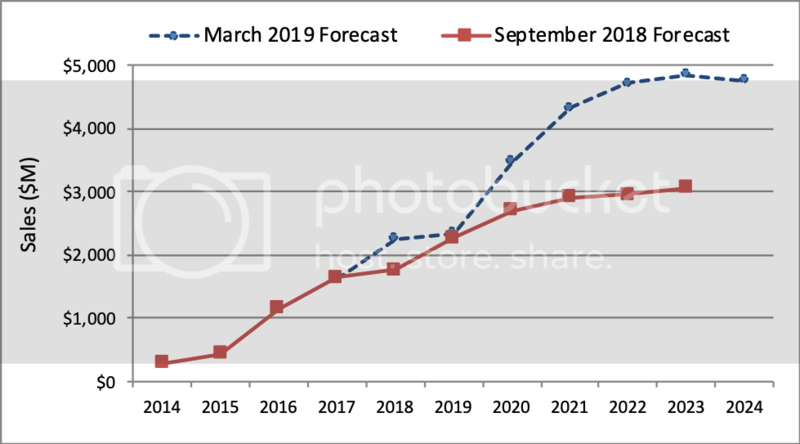 Figure 2 shows the changes in our forecast for all 100GbE optical transceivers, comparing data published in September 2018 with the latest forecast (March 2019). The revision upward of 2018 sales is mostly related to separation of sub-spec CWDM4 transceivers from the full spec version, adjusting pricing for these products and adding volumes to account for new suppliers of 100GbE products that are not yet sharing sales data with LightCounting. Facebook’s latest F16 network design and their plan to continue using 100GbE connectivity resulted in a significant upward revision of the forecast for 100G CWDM4-OCP modules, boosting projections for the total sales of 100GbE transceivers in 2020-2024. The bad news is that the outlook for 2019 is pretty flat. Several suppliers reported slower than expected sales of 100GbE products in the second half of 2018 and it seems that softness in this demand will extend into the first half of 2019. This softness is most likely related to limited supply of 12.8 Tb ASIC chips such as the Tomahawk 3, which Facebook is using in their new Minipack switches. Once these issues are resolved, the demand for CWDM4 is expected to skyrocket in the second half of 2019 and make a real difference to the market in 2020-2022. Sales of sub-spec CWDM4 modules are projected to peak in 2022, as Facebook starts transition to 200GbE connectivity. The revised forecast for sub-spec CWDM4 transceivers added an extra $1.2 billion to the total sales of 100GbE products in 2023. Increased projections for DR1 modules, used in combination with DR4, added another $680 million to the 2023 forecast. LightCounting’s High-Speed Ethernet Optics report offers a comprehensive forecast with more than 50 product categories, including 10GbE, 25GbE, 40GbE, 50GbE, 100GbE, 200GbE, 2x200GbE and 400GbE transceivers, sorted by reach and form factors. It provides a summary of technical challenges faced by high-speed transceiver suppliers, including a review of the latest products and technologies introduced by leading suppliers. The report is based on confidential sales information and on detailed analysis of publicly available data released by leading component and equipment manufacturers along with considerable input from industry experts.